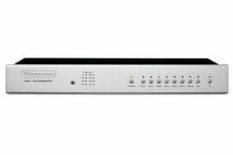 Bryston BDA-1 review | What Hi-Fi? Make no mistake from the styart, this Bryston is a ‘serious', high-end hi-fi component, with a price tag to match and the capability of transforming a system. The BDA-1, our current Award-winner, is expensive, but it's also highly specified in terms of connections. Here, alongside optical and coaxial inputs (two of each) you also get a USB socket – something that's missing from even the best class-leaders. There are even two BNC inputs, though these are unlikely to be useful to anyone who doesn't work in a recording studio. Signals fed into any of the digital connections are passed through impedance-matching transformers, before being sent through an upsampling circuit, which can be engaged or disengaged at the touch of a button on the front panel. After the upsampling circuit, it's on to the twin Crystal CS-4398 DACs, where the musical signal is converted, before being outputted via a pair of Bryston's own Class A discrete operational amplifiers. Phew. The power for each stage of the process is individually regulated, and there are entirely separate transformers for the digital and analogue sections. The signal is also carefully re-clocked to reduce jitter. As you can tell, there's some seriously high-grade sonic technology inside this Bryston box. Obviously, the BDA-1 is very thoughtfully put together, and as its Awards success should suggest, this is a very capable performer. The first thing you'll notice about the delivery is its spaciousness, a trait that lends itself very well to the atmospheric and ethereal Alice in Wonderland soundtrack. Opener, Alice's Theme, has a great spread across the the soundstage, with a beautifully three-dimensional quality to the choir's vocals and a broad, spacious presentation of stringed instruments. Excellent tonal neutrality ensures that while the bassy horns are deep and rousing, they avoid becoming overbearing in the midrange, while the treble twinkles nicely without ever becoming harsh. Continue to test its mettle courtesy of the sophisticated cartoon funk of Gorillaz' Plastic Beach, and the BDA-1 proves itself to be tight, punchy and dynamic, following the album's diverse and frequently changing rhythmic styles in fine fashion. A switch to Eels' End Times proves that the Bryston has very impressive detail recovery, revealing all the charming lo-fi qualities in this rather DIY recording. There are times when a bit of background crackle is more than welcome in a musical presentation, and the BDA-1 manages to balance this while also digging up all the emotional nuance and imperfection in E's vocal delivery and acoustic guitar. So, hang on a minute: if the Bryston is so good – and it is – how come its star rating has gone down from five to four stars? Simple, there are - unbelievably - even better rivals available. Even the areas in which the BDA-1 is at its very best (detail, dynamics, neutrality), it is nonetheless clearly beaten by worthy opponents, leaving us with no choice but to mark it down. But make no mistake: the Bryston is still a great DAC, and with its studio-strength build quality and full five-year guarantee, it has everything necessary to offer serious, long-term enjoyment.